Wrriten by Michael Crichton, the Sphere is another one of those Hollywood blockbuster movie adaptations of his book that begins with an alien spacecraft being discovered on the bottom of the ocean floor. Bringing together a group of specialists to investigate, Captain Barnes (Peter Coyote) leads them into the unknown which includes psychologist Norman Goodman (Dustin Hoffman), biochemist Beth Halpern (Sharon Stone), mathematician Harry Adams (Samuel L. Jackson) and astrophysicist Ted Fileding (Liev Schreiber) in this surreal science fiction story. Upon discovering the craft, they realize that the craft is actually a vessel from the future and more specifically the United States. As they investigate the origin of this craft and how it got here, they discover that it was dragged through a black hole and to add to the mystery, they discover a giant metallic like sphere aboard the craft which seems to pulsate. Eventually strange things begin to happen on this craft and through the ships logs, they discover that something more nefarious is the cause of their problems, however their paranoia soon starts to build. Of course, the actors in the movie help portray the raw feelings and emotions of this story, however the story begins to break away during the last half of the film as the investigators discover that they are responsible for the strange manifestations that are plaguing them. The Sphere is an interesting premise but during the Crichton period of Hollywood, it seemed he could do no evil and producers jumped on his books. 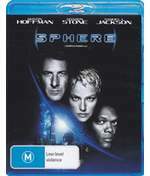 Unfortunately the Sphere is one of those movies that began with a great premise, however as the movie flowed, it eventually lead to a lackluster ending. On Blu-ray, the video transfer is clean with detailed images and strong blacks. The special effects look great for a movie of this era and it's definitely one of the better transfers from Warner. Adding TrueHD 5.1 for sound, you hear everything in this movie that is not only exceptionally crisp but helps immerse (pun intended) into this underwater science fiction flick. For extras, the movies come with commentary by Hoffman and Jackson that is actually quite interesting and once again Samuel L. Jackson steals the show. To add to the special features, it also comes with some featurettes in standard definition about the making of the movie, the theatrical trailer and three TV spots. All in all, the Sphere is an interesting science fiction movie that attempts to go where no science fiction has gone before, well... not really but it tried for new heights and almost succeeded. There's definitely worst movies out there!